In early 2011, Levi’s was a small, successful soul food restaurant in Maryland. When it became time to open a second location, the owners realized they had a big problem: If customers searched for Levi’s online, they’d find a few other soul food joints at the top of their search results. Levi’s was buried on page 2 or 3. The restaurant’s original website was entirely built in Adobe Flash, so it was effectively hidden from search engines. It was also hard to update. Point Blue Communications worked with Levi’s to identify a suitable WordPress template, then built a site that highlighted the best that Levi’s had to offer. We included customized Wufoo forms that automatically notified the catering manager when a catering order was placed online, added the restaurant’s entire menu to the site, gave the owners a platform for their blog, and added social media links everywhere so that visitors can share pages with their friends. When I needed to update our website, I wanted to find a company that would work with me and not create something that did not incorporate our brand. Point-Blue was the clear choice after I had my first meeting with them. They seemed very interested in what I had to say and what I wanted in my website before starting the project. This was very important to me because I believe our website is a reflection of our company. Point-Blue did not fail in this regard. I would recommend them to anyone who needs to a new website! Once the new site was launched, the restaurant’s position in search rankings rocketed to #1 on Google (for a search for “levi’s restaurant”). 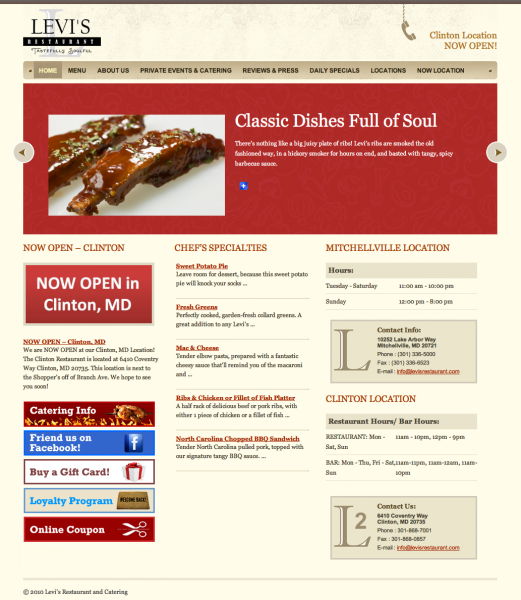 It’s now ranked second when users search for “soul food Maryland”. The end result has been increased sales and more catering orders, and site modifications are now incredibly quick and easy. © 2010-2013 Point Blue Communications, Inc.